I discussed my pursuit of WAS, and then 5B WAS before. 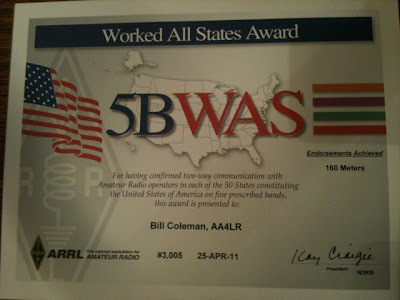 Well, after a couple of miscues, including a lost QSL card, cancelled and re-issued credit cards, and a few month-long delays -- I finally received my 5B WAS award with the 160m endorsement. Thank you so much to the hard-working folks at ARRL HQ for finally straightening this out. It's nice to meet a goal after 35+ years of hamming. Something that only 3,004 hams before me have done. 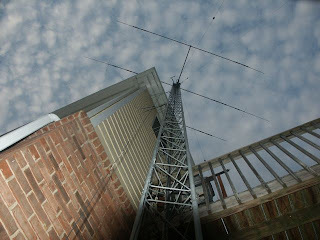 WAS on 30m, 17m, and 12m will take some doing, but, with time, it may happen. Although, right now, I'm more interested in building my DXCC totals. Retrospective - 1997 WWDC Fireside "chat"
With this week's untimely death of Steve Jobs, I was thinking of the few times my life had intersected with Steve -- this was the closest I had come. John Gruber recently linked to a video of this very special WWDC session. The video quality is horrible, but the talk is interesting. I remember this session well. I was sitting somewhere on the left aisle of the audience, about 1/3 back from the front, which was my usual spot for most sessions. It was my first experience in the "reality distortion field" of Steve Jobs. I must say, there was definitely something to it. The moment in time this talk took place is worth noting. Steve Jobs was just an "advisor" and his opinion "didn't count." A couple of weeks after this talk, Jobs would sell all but one share of his Apple stock, which would precipitate a stockholder crisis that eventually lead to the ouster of Gilbert Amelio about a month later. Jobs would step into the resulting power vacuum and assume control. But that hadn't happened yet. It's most interesting to look at how Jobs answered the questions from the floor. He took each one seriously, and did not try to answer right away. It was more important to give a good answer, than give a quick answer. Jobs discussed many of the benefits of Rhapsody, but that concept didn't last a year. By WWDC 98, Apple abandoned the Yellow Box on Windows. The development tools were good, but perhaps 5-10 times better is something of an exaggeration. Jobs wanted Mac cloners build whatever hardware they wanted, but wanted a lot more money for the MacOS license. Even when he took control, that wouldn't happen. And while there was no revolution with Gigibit ethernet replacing hard drives, the network certainly plays a larger and larger role today. Most interesting near the end of this talk that Jobs describes a hand-held device that has cellular networking and a hardware keyboard -- he perfectly predicts the entry of the Blackberry, which would be announced 18 months later, and would dominate its category for nearly a decade. His vision extended even to products Apple would not produce. View of the shunt feed wires going up the tower. I can't believe it. Before the 2010 ARRL 160m contest, I noticed that a score over 100,000 in the Southeast division might possibly win the Low Power category. 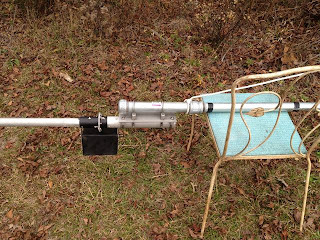 As a result, I put in a pretty full effort with 100 watts and my modest antenna. I scored over 100,000, and I hoped it would last through the judging. When the claimed scores came out on the 3830scores mailing list, it looked like I came in second place to WA1FCN in Alabama by only a couple of thousand points. We both had 689 QSOs, but he had one more multiplier -- 79 to my 78. Well, the results database has been published. Looks like I came out on top. While WA1FCN had more multipliers, it looks like more of his QSOs were thrown out in the adjudication. I lost nine, but he lost 24, which put me ahead almost 2,000 points. Not my first division leader low-power win -- the other came in 1989 in the ARRL Sweepstakes Phone. That was right after hurricane Hugo, and a lot of Caribbean stations were off the air. September 3rd brought forth some fond memories for me. It stands out in my mind because of the evening of September 3rd, 1971. I received my first radio, a Heathkit GR-81, Christmas 1970. 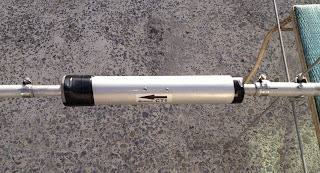 My first logbook entries are from January 9th, 1971, since it took us a while to build, especially considering that the band "A" coil we got with the kit was defective. 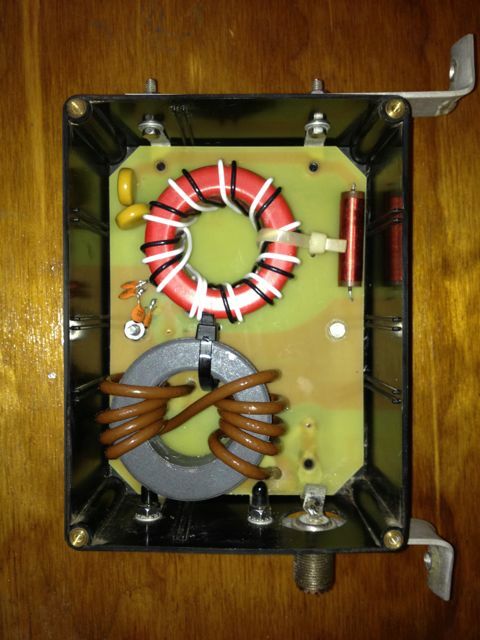 For many months, I used the GR-81 with nothing more than a bit of magnet wire wound around my attic bedroom. This worked, but it wasn't very effective. I listened to some local AM stations, and a few shortwave stations. The GR-81 wasn't very sensitive on band "D", where most of the shortwave broadcast bands are, so I concentrated on broadcast band DXing. With the summer ending and school about to start, I managed to take a trip to the electronics store and buy some wire. I believe at that time, I bought a 25 foot spool of very small speaker cord and completely unzipped it. In my youthful frugalness, I had computed that this resulted in a cheaper acquisition of 50 feet of wire than buying a 50 foot spool outright. That 50 feet of wire went out the window of my attic bedroom, across the roof of the garage, and was anchored to a climbable tree on the other side of the yard. In retrospect, it couldn't have been horribly effective -- it was too low to the ground, being only 10-15 feet high for most of it's length. 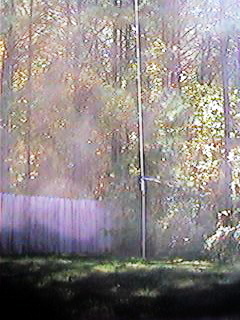 However, it was outdoors -- this being my first outdoor antenna. The results were pretty dramatic, compared with the indoor magnet wire. 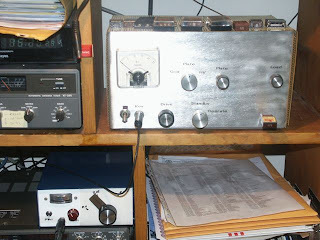 That evening, I started at the top end of the AM broadcast band (band "B" on the old GR-81), and worked my way toward the bottom. I must have logged about 40 different stations, many of them new. This experience made an impression on me. For the next several years, I always attempted to do this AM "countdown" around labor day weekend. In addition to signaling the start of the school year, it was also the start of the radio season. It's hard to believe it's been 40 years. I still have that radio, and it's still in good working condition. And somewhere in my files I have that first logbook. When I was a novice, I really wanted to earn the Worked All States (WAS) award. I wasn't an ARRL member at that time, but I figured I could go ahead and work the states and get the cards. Well, I did get confirmations for 30-some states, but never quite completed that award before moving to Georgia. In the late 80s, I married, bought a house and set up a modest station, the dream of earning WAS came back. But then something happened. During SS Phone in 1988, I managed pull a sweep -- working all ARRL sections (76 at the time). I didn't just work all states, but I had worked all states in a single weekend. Earning WAS didn't seem like enough any more. What I really wanted was five-band worked all states (5BWAS). What I'd missed though, was that you can work all the states in a weekend, but getting the cards to confirm that takes some doing. When I moved in 1994, it was far enough to reset my WAS efforts, and I hadn't even collected enough cards for basic WAS. Logbook-of-The-World (LoTW) changed all that. Soon after signing up, the confirmations poured in. By the time the site supported the WAS award, I soon had enough to qualify for Basic and Phone WAS in march 2006. By next year, I had CW, 20m and 40m, and added RTTY in the fall of 2008, and 160m shortly thereafter. Working all states on each band takes a little patience. 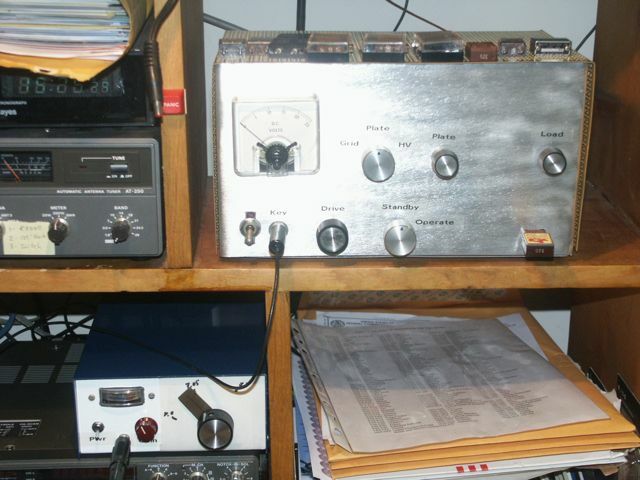 The process can be accelerated by operating contests: North American QSO Party (NAQP), RTTY Round-up, and ARRL Sweepstakes (SS). 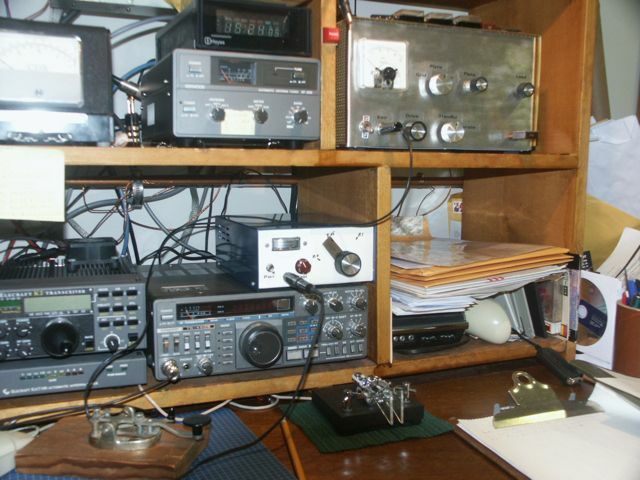 It certainly helps to work all three primary modes: CW, Phone, RTTY. 20m - easiest band to work all states. During one NAQP, I had a fabulous run on 20m, and later realized I had worked every state on 20m during that contest. 40m - certainly the second easiest. With the right conditions, 40m can be just as productive as 20m. Probably a bit of a challenge without a directional antennas. 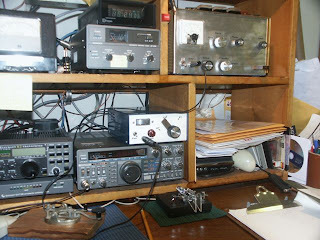 160m - if you operate the ARRL 160m contest, as well as the CQ 160m contests, it is surprisingly easy to get 160m WAS. You don't need huge antennas. I worked all states with just a short, shunt-fed tower. 10m - if you operate the ARRL 10m contest, you can make a lot of headway on this band. The tricky part is the close-in states. Ground wave may not be effective for more than a few dozen miles, so you either have to look for backscatter opportunities, or wait for those rare conditions during the sunspot maximum where we have shorter skip. 80m - this would be easier than 160m, except that there aren't dedicated contests for this band. The hardest states are probably those farthest away. For me, this was AK and HI. 15m - short-skip makes this just as hard as 10m, but without the benefit of a dedicated contest. My last state for this one was SC. After years of operating contests and collecting confirmations on LoTW, I just needed two to finish 5BWAS: 15m SC, 80m AK. I did some data-mining of my log books, and found I had three QSOs with SC over the years. I mailed out QSL cards with SASEs, and was lucky enough to get one station to confirm me. I'm currently waiting for 15m WAS to be awarded. Alaska on 80m presented an interesting challenge. But, I had worked KL7RA on 160m using both CW and Phone. Seems I just had to look for AK on 80m this winter. Despite watching for spots and coming close a couple of times, I started to get worried -- spring was almost here, and it would soon become hard to work anything that far away on 80m due to summer noise. I finally broke down an e-mailed KL7RA and asked him when he'd be on 80m. While he was QRV for the ARRL DX, I managed to miss him again. Finally, Rich agreed to a schedule. The trick is to find a darkness path between GA and AK. The most optimum time would be right at Georgia sunrise -- but I couldn't ask Rich to get up in the middle of the night. Instead, we opted for about an hour and a half after his sunset -- which is 2:30 AM for me. It took three tries, but we finally made the connection with readable signals. Thank you Rich! With the confirmations in hand, I now just have to wait for the ARRL to process my 15m WAS, apply for 80m WAS and ask for the 5BWAS as well. So, very soon I will have accomplished what I set out to do over 20 years ago. OK, I'll admit. I have been an Apple fan for more than 25 years. I first laid hands on the Lisa and the Macintosh in the summer of 1984, and I began programming the Mac in August of 1984. I've been an Apple developer off and on since then. Virtually all my home computers are Macs, and I've encouraged my friends to buy Mac for years. However, I 'm not what you call a raving Apple fan-boy. I thought the iPhone was interesting, but I wasn't one of those who stood in line for the original 2G, or the 3G, or the 3GS release. My biggest problem was that I felt I already spent far too much each month for my cellular wireless service, why spring for $30 more each month for the data service? My wife convinced me to get an iPhone 3GS Christmas 2009. I've been using it for a over and year, and I'm pretty impressed with it. However, the screen being small there's really a limit to what you can do with it. After a year, though, I'm not going back to a feature-phone. The iPad redefines the paradigm of computing, the same way the Macintosh did in 1984. Your first impression may be that the iPad is just a bigger iPod Touch. But there's a profound difference. The bigger screen invites a more immersive computing experience. Touching the screen directly creates a very intimate connection with the applications. And the use of gestures dramatically reduces the visual clutter required to drive our mouse-and-keyboard machines. It is very hard to articulate, but I am convinced that the computing experience 20 years from now will look remarkably like the iPad, and not as much like the Macintosh. I felt the same way 25 years ago, after using the Macintosh -- and that feeling was correct. The Macintosh, Windows and even Linux machines offer a roughly equivalent computing experience: a graphical user interface, driven with a mouse and keyboard.